The District Championship came down to the final two events and every single point mattered over the last two days of competition. Gilmer was relentless in their efforts and did really well in their field events, better than expected. After the 200M dash, Spring Hill boys were down by 21 points to Gilmer, but had three good runners ready for the 1600M Run. Those guys, Kalen Barlow, Nick Bodenheimer, and Caleb Hutcheson, placed 1st, 3rd, and 4th to give the Mile Relay a chance to bring home the district championship. Spring Hill came together as a team and competed for each other. 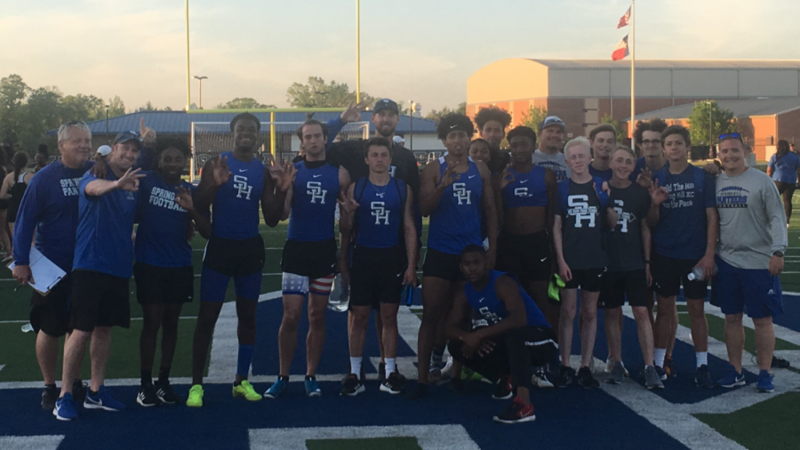 The boys were down three points to Gilmer, and figured out that all they needed to do was beat Gilmer in the 4X400. Spring Hill had the fastest time going in, but only by 2 tenths of a second to Gilmer. Chapel Hill’s time was right behind Gilmers. Zach Henry got the 4X400 started by running a great opening leg and gave the lead to Jay Rockwell. Jay had to battle a tough 2nd leg that actually passed him before he passed them back up and gave it to his brother, Vencent. Big brother Rockwell got the stick in 2nd place, but about 10 meters in front of Gilmer and he ran a great leg to keep the separation for Austin Martin to finish it up. Martin ran an impressive 50 second split to hold on to 2nd place and win district by 1 point. We could mention several guys names that took a big part in the victory. The guys who scored the most points in the meet and are Spring Hill’s Top Athletes for District are Kalen Barlow (20) and Zach Henry (18). Kalen took 1st place in both of his events and qualified for Area in the 1600 and 3200. Zach qualified in all three events that he competed in as well. Henry took 4th in the Pole Vault, 1st in the 400M, and 2nd in the 4X400 Relay. Please take time to congratulate all of these kids. View the final results on Microsport.com.